When life gives you bananas, what will you do? Summer time is the time when I have overload of over ripe bananas in my kitchen. Being a banana fan, my hubby never forgets to grab a bunch whenever he stops at the grocery store to buy anything. When I do my weekly grocery shopping, I too make sure to grab his favorite fruit. At times, we will end up with lots of bananas and if they don't finish within the anticipated time, we will have an overload of these overripe fruit. But I always make sure that none of them gets wasted. The overripe bananas are peeled and dumped into a ziplock bag and they go straight into the freezer. 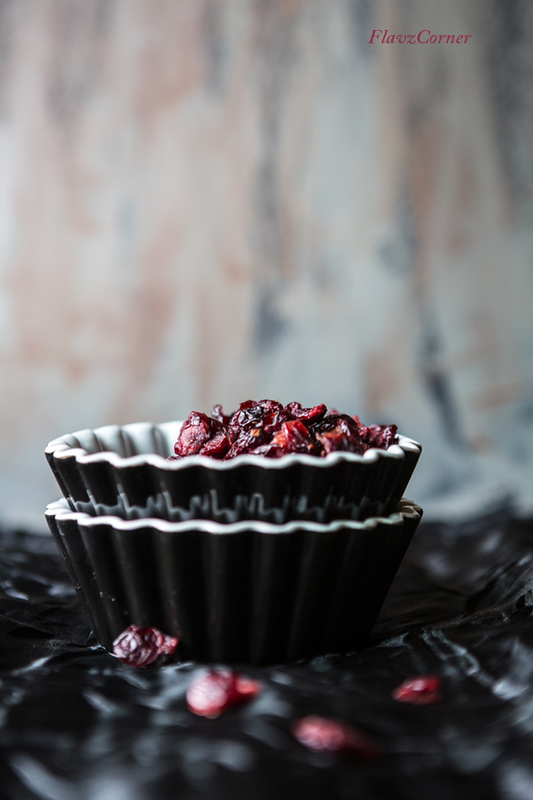 I use them in smoothies, banana bread and Unniyappam (a Kerala tea time snack). Just puree the frozen banana in the blender and you are good to use them in the batter of banana bread and Unniyappam. Here is the experimental banana bread I tried without eggs and they turned out to be very moist and delicious. 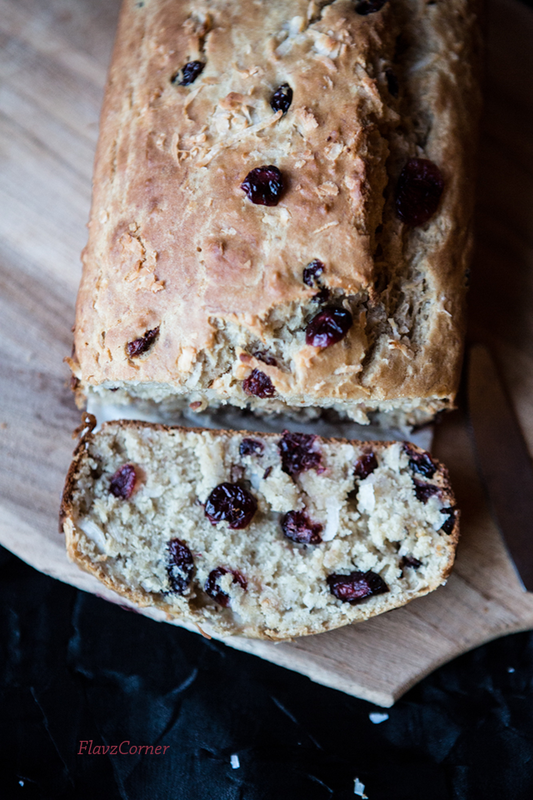 The addition of chewy coconut flakes and tangy dried cranberries complemented the egg-less banana bread. This recipe is a keeper for lent period when it's a challenge to bake egg-less. In a mixing bowl of a stand mixer, mix the 3/4 cup plain yogurt with 1/2 cup brown sugar. Add baking soda and baking powder to the yogurt and mix well. Let it sit for 5 minutes. Meantime, sift the flours and keep it aside. After 5 minutes, you will notice some bubbles in the yogurt mix. Add milk, oil, mashed banana and vanilla to the yogurt mix and mix for 30 seconds. Add the sifted flour mix and salt to the wet ingredients. Fold in all the dry ingredients and mix for another 10 seconds. 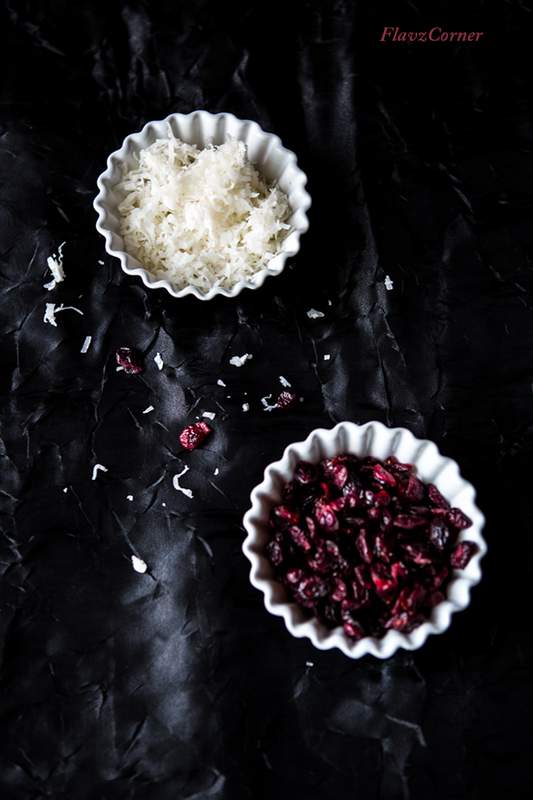 Fold in the coconut and cranberries. Pour into a greased loaf pan or parchment paper lined loaf pan and bake for 50 - 55 minutes or till the loaf is bulged on the top and a toothpick comes out clean when tested on the center of the loaf. Keep the bread in a air tight container or wrap it with a aluminum foil and refrigerate. Properly stored banana bread lasts for a week in the refrigerator. Looks really moist even though without egg. Would be great to toast a few slices for the breakfast. It's such a lovely bread. Banana bread is my go to breakfast. This combo is amazing. Banana overload happens here too once it starts spotting then nobody wants it. Just made a batch of unniappam to finish it. 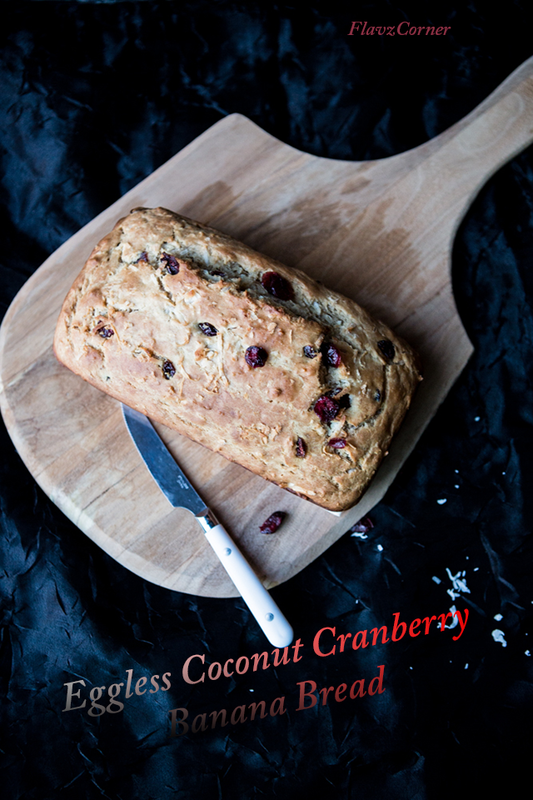 Love the cranberry and banana combination perfectly made bread. I really loved the black and red treatment beautiful. Good idea to freeze extra bananas! Although we're pretty good at buying exactly what we need. Which becomes a problem when we want to make banana bread! Actually microwaving the bananas for a bit helps give them the right flavor/consistency. Anyway, this is super -- really good stuff. Thanks.